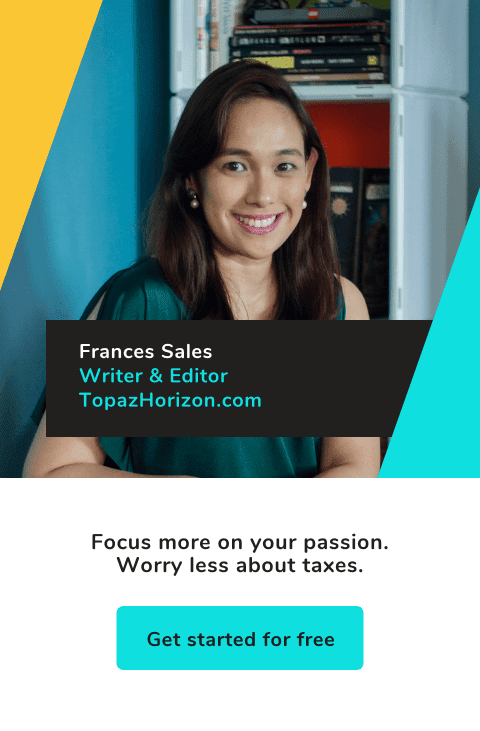 TOPAZ HORIZON: Uniquely Singapore: I spent P10,000 on food and food alone!!! Uniquely Singapore: I spent P10,000 on food and food alone!!! Let's continue with our Uniquely Singapore Series, shall we? 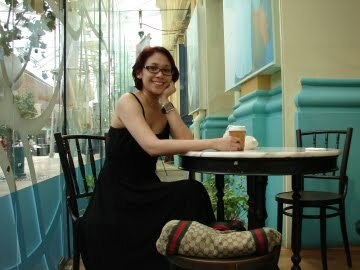 This is me at the Royal Selangor cafe in Singapore having chai and a siopao. 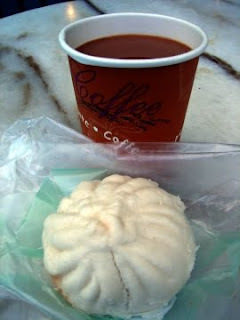 This was my breakfast. The siopao was so tiny, I almost wanted my money back. It's a good thing the chai was amazing. Rich and bitter and sweet and full-bodied. Wonderful way to start any day! 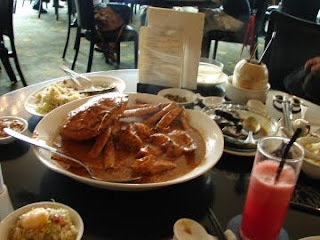 When you're in Singapore, you have to try the chili crab. That's what everyone told me and, because I always have to eat the best when I'm somewhere new, I let my friend Ana (that's her in black in the middle of the photo) lead me to No Signboard. That's the name of the restaurant. 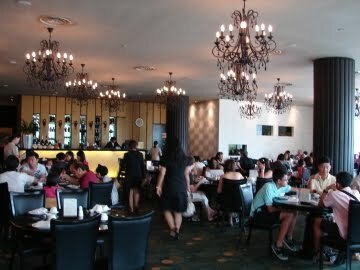 And if it looks like a posh place, then your eyes aren't deceiving you. This chili crab was the bomb. It looks tiny in the photo but the crab was actually as huge as a dinner plate. It was also frikkin' expensive. I literally felt the crab crawl up my esophagus when I saw the bill. I just slipped my credit card to the waitress, hoping my husband won't kill me. When I did get home, still stuffed with crab and the amazing mushroom salad, and told Vince about my wildly expensive meal, he said, "Was the crab good?" He smiled, "Well then, that's okay." OMG. I tell you I have the best husband. Ever!!! 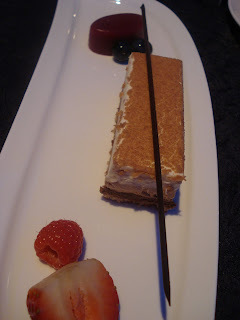 These were all served at the Nuffnang Asia-Pacific Blog Awards. And they were all a delight. Thanks to Franny Haw for the photos! Now, not all of my meals were so haughty. We bloggers feasted on the hawker stuff--cheap and edible but not exactly the kind that would make your eyes roll in ecstasy, like this bland pork rice topping meal I had (I could tell Anton Diaz was disappointed with my safe choice!). But that nasty-looking crab that's insanely priced? Heaven. I spent an indecent amount on that crab. Well, it was worth it! I would like to thank Nuffnang and the Singapore Tourism Board for this Uniquely Singapore Series. Glad you had a great time eating around Singapore! 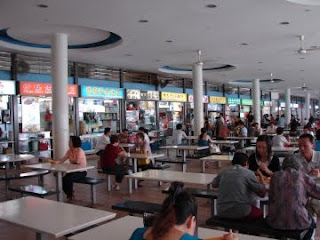 What do we love best about our foodie adventures here, the fact that their authentic and... that you can get Indian Thosai one day and Chinese potstickers the next! So how much was the crab? hehe. Just curious. P.S. 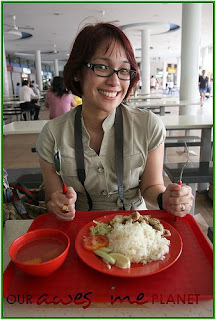 Your food-related blog entries never fail to make me hungry.